Ahh a sanctuary, I’m becoming increasingly fond of creating sanctuaries for myself in Minecraft, whether it be on a cloud made of wool in the sky or a house dug into the ground I sometimes feel the need to shield myself off from monsters and sometimes even other players unless I’m in a town community as I am currently. However the setting for this creation was rather a lonesome one as I had mentioned in my previous post I had come from a brief stay in the Mikeland Factions server I had returned to Fusionblox and was still having a lot of trouble finding a group of people to build with, it did seem a friendly server but very group-oriented so much so that I couldn’t even find the group of new guys to play with, also I have to mention that there were a few restrictions on this server so unless you paid a fee you couldn’t get access to certain features such as teleporting and chest protection. 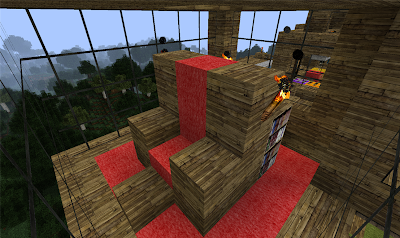 So I was wandering alone by myself and finally decided to just go back to what I had done in the beginning and build one my own, while watching the conversations go past and listening to Skype and thus began to build my ingenious creation. 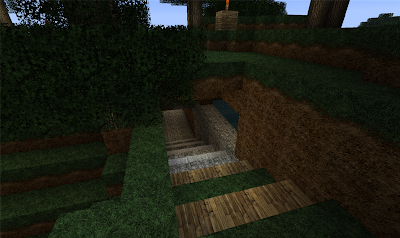 I had been wandering through a forest when I came across a small raised hill, which gave me a good idea for a wall, but a very environmental wall, well as environmental as chopping down trees then making them into wooden plants then building a wall, can be so I built the wall about 5 or 6 blocks high around the entire hill, this was basically just to keep out the monsters as I decided to create an entrance at the front and dig out an entryway with some steps to the top of the hill which was covered in trees. I called it my “Green Hill Sanctuary” sanctuary from monsters that is (well technically spiders could climb the walls) you can’t get sanctuary from other players not matter how hard you try, unless you’re an admin but of course if you’re an admin you already have to deal with moaning players on a daily basis. 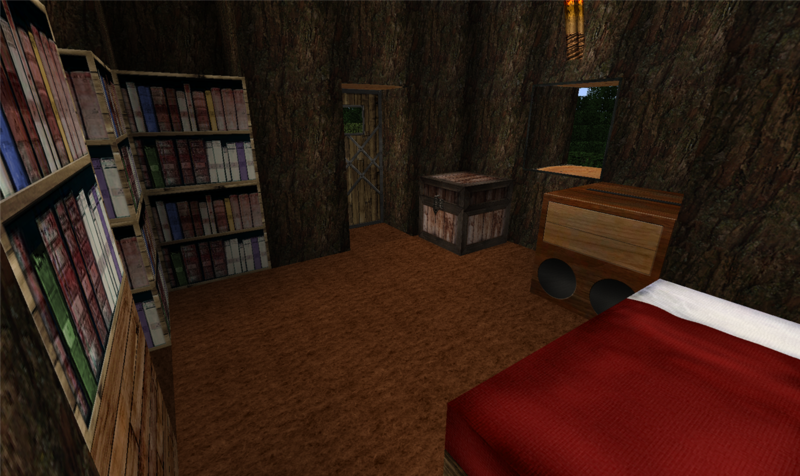 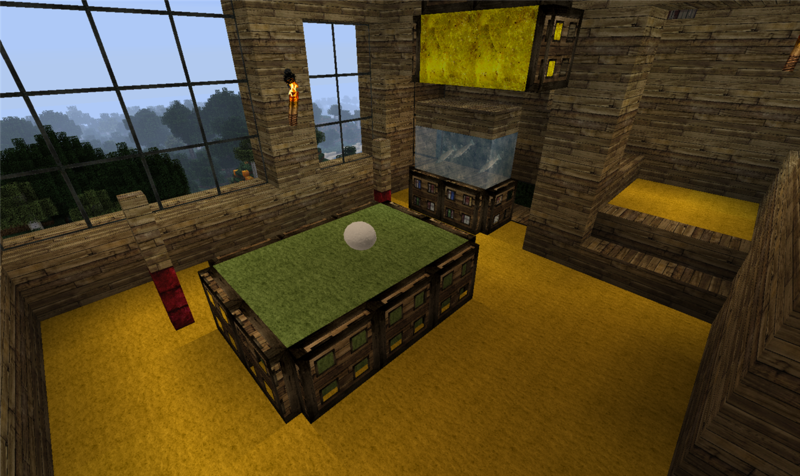 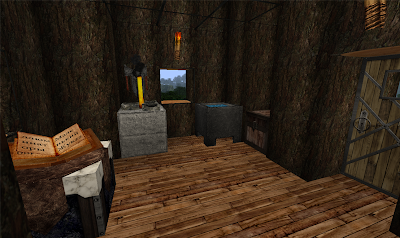 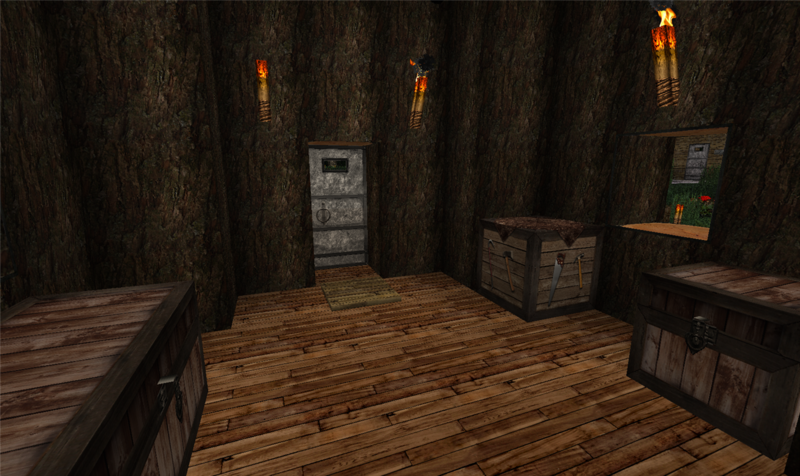 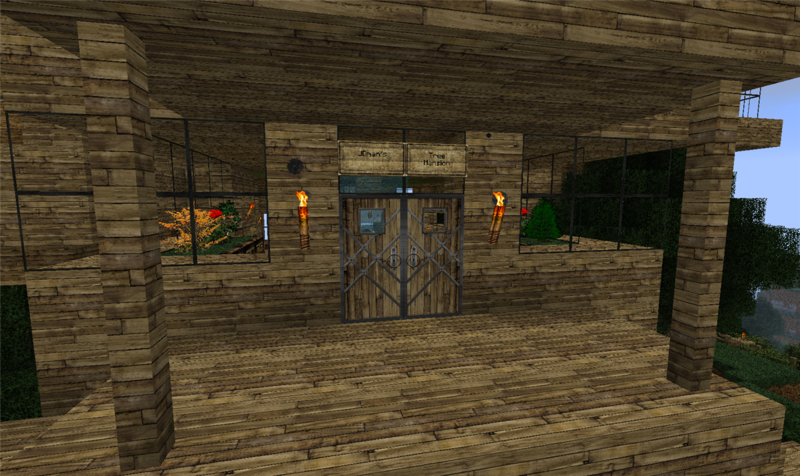 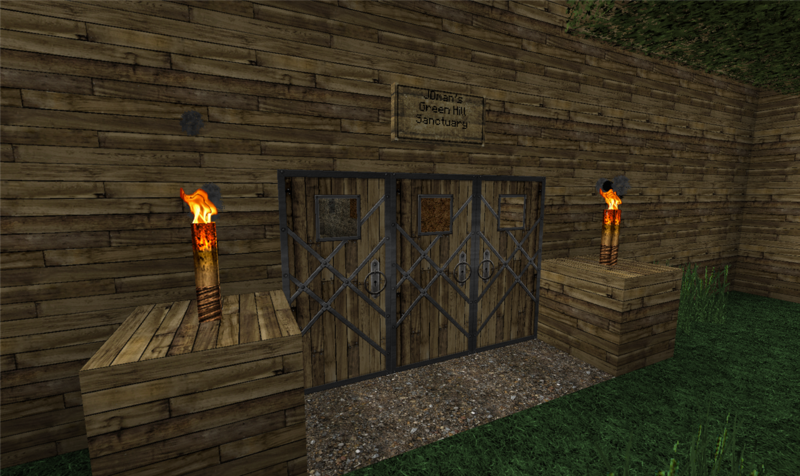 I then started work on what would be humble abode, and you guessed it, it would be a treehouse. 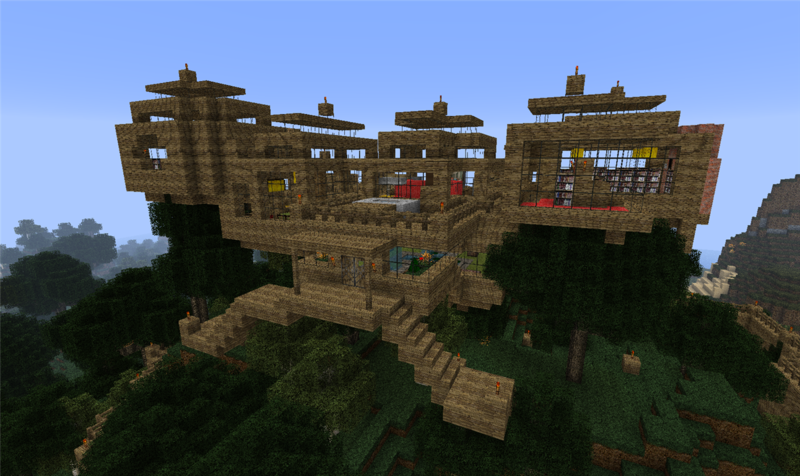 This treehouse was actually a variation on my first major treehouse that was created back in March/April 2011, I basically used the same design structure I had used in the past which is basically making large square (or rectangle) wooden platforms on top of the surrounding trees, then joining them together using stairs and more wooden planks. 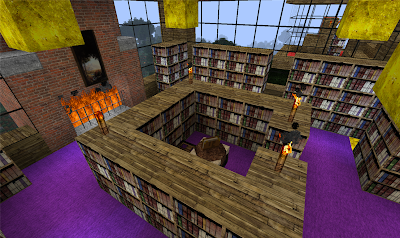 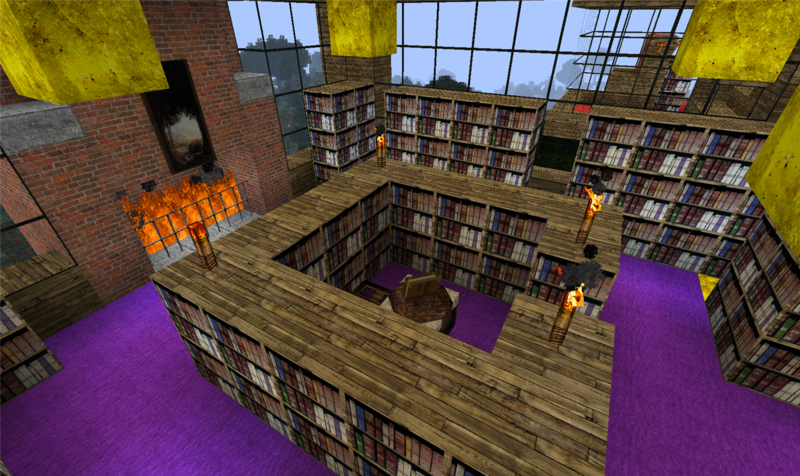 This time I decided to focus on more interior than exterior and made the rooms quite large, of course I had to factor in rooms for both Enchanting and Alchemy, so this made the whole structure a bit bigger (though the library can double as an enchantment room). I made roof access and fences around but it was really just for convenience as most of the features were inside the house. 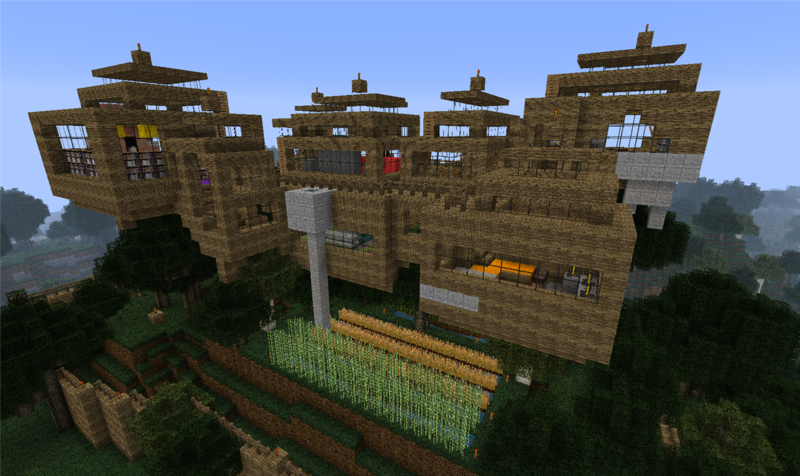 In the past I was finding it hard to fill some of my larger houses or creations especially with so many floors or open spaces. 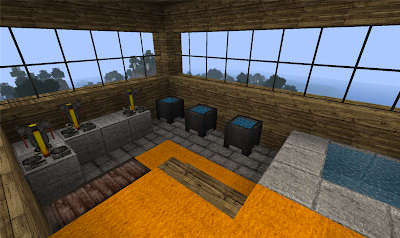 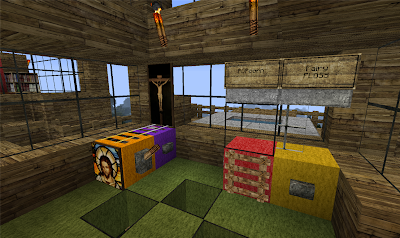 I used quite a few inspirations from a website I found that detailed various ingenious and well designed Minecraft Furniture, most of the designs you see here come from what I've seen both on the website and on their server, even though things like a Minecraft gym or pinball machine might seem bizarre I urge everyone to take a look if they are ever stuck on how to properly furnish a house or building. As I mentioned previously I had to get a mod to do some pretty tricky things for me to get this into a singleplayer map for me to be able to work on but of course in doing this he had to take the rather large chunk of land and dump it into another so the whole hill didn’t exactly match up, I decided to just fill in the gaps with dirt and make a staircase up to the entrance from the lower ground, this didn’t exactly work as I’d hoped, and the funny thing was a short time after it had been completely finished I went into the FusionBlox server and found that the survival map hadn’t even been wiped for the new patch yet but ahh if I hadn’t of had it moved I would have lost it and had to rebuild in singleplayer anyway. I think that it came out pretty well I had a rooms for just about everything and I also made a small farm inside the sanctuary I named it the Tree mansion though it really wasn’t that big, tree house wise it was quite a mansion indeed. This is a walkthrough I made of the whole Sanctuary, sorry it's not the best quality it's the first time I've tried soemthing like this before. 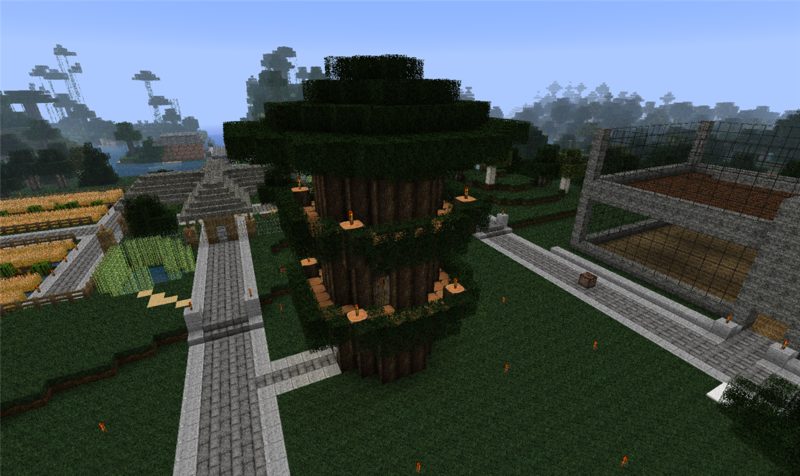 After the whole debacle with making the huge tree mansion in multiplayer. 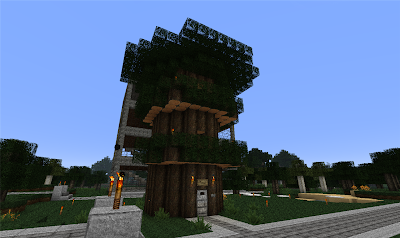 I decided that my first house on the Ozgamerparty Minecraft Server was going to be simple but still effective and worthy of my talents (insert ego-related remark here) though I have long since realised that it's not easy to change nature to your own designs (unless of course you are these people) I have tried time and time again to make a good looking tree house, but due to spacing requirements you just end up with a big fat trunk and one hell of a job if you're going to make it look like the rest of the trees in Minecraft. So I decided to just build a reasonably small trunk nothing too big with a sort of leafy roof, I used all logs and wood from jungle biomes and planted ferns around to keep the jungle theme.I also made one hell of an effort to get enough cocoa beans to carpet my bedroom in brown wool, all I can say is that it took a lot of dungeon searching and infiltration. The whole thing has 3 levels and a balcony on two and also an underground basement, nothing too fancy just simple and functional. 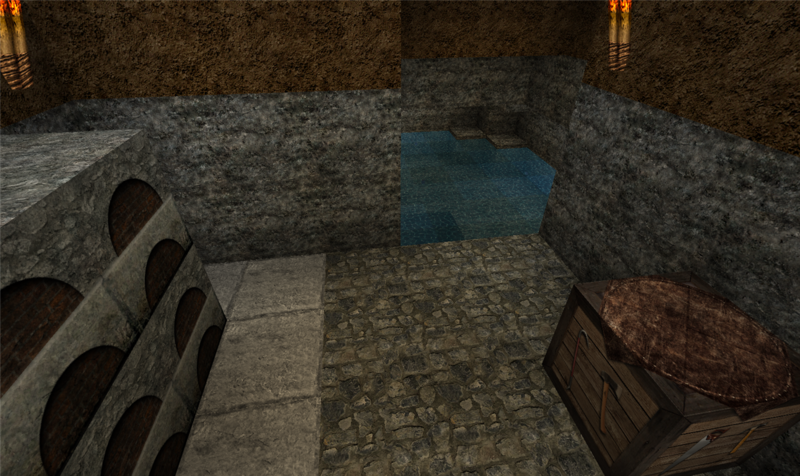 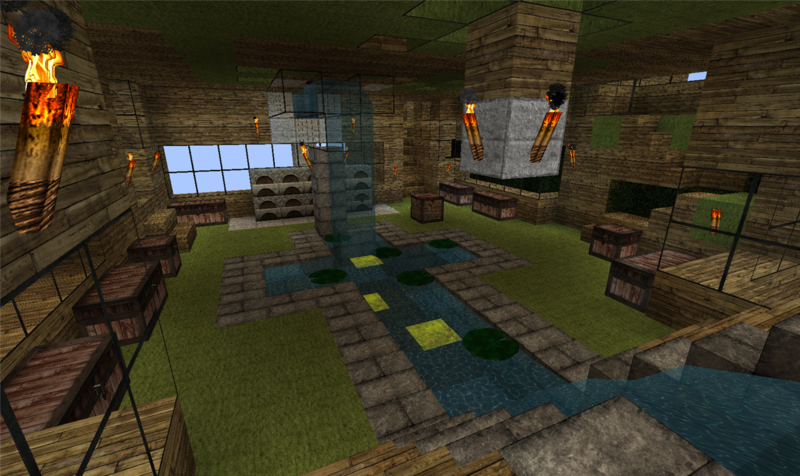 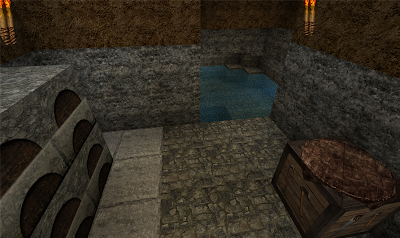 The top level with enchanting table, brewing stand and cauldren, I glassed up the roof to avoid falling leaves. 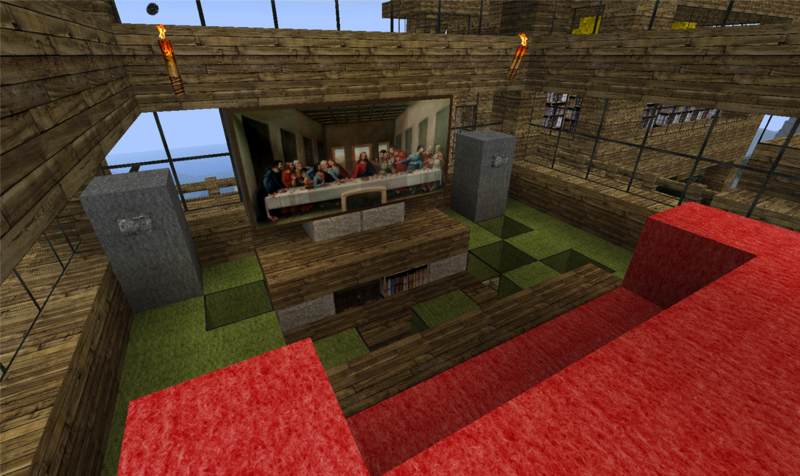 Thats it for now, stay tuned for the full report on the new Ozgamerparty server and the Tribalfieldies return. 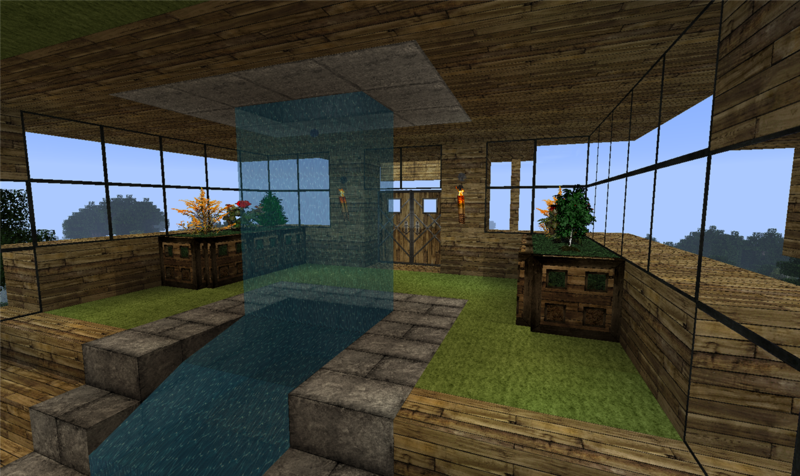 How did you get fish in your tank? 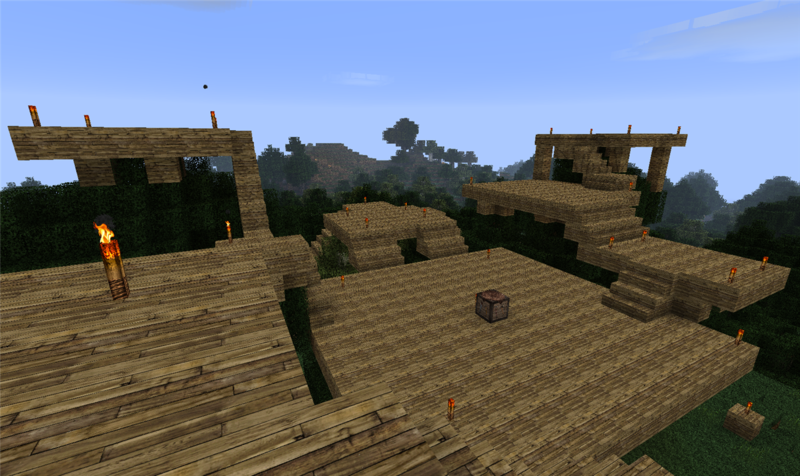 Just sort of... throw them in its direction til they were right, take a screenshot, and pick them up again?